We sit down with each and every guest on arrival and help you plan your time in National Park Durmitor whether it be hiking, biking, rafting, canyoning or simply just exploring the beautiful surroundings in the fresh mountain air. We offer 6, 5 and 4 bed dorms, as well as private double/twin rooms, and studios. All rooms have shared bathrooms. One of the best hostels I've stayed. Best tips for hikes possibility of doing rafting and other activities. Alex and volunteer were super-helpful. Our stay at the Hikers Den was the highlight of our trip, Alex and the other members of staff were always on hand to assist and offer advice, the rooms were great and the location was absolutely amazing. A must for anyone travelling in Montenegro. This place feels like a home away from home and is perfectly located. Alex and Stefan are very knowledgeable and helpful hosts. The best hostel I've ever stayed in. 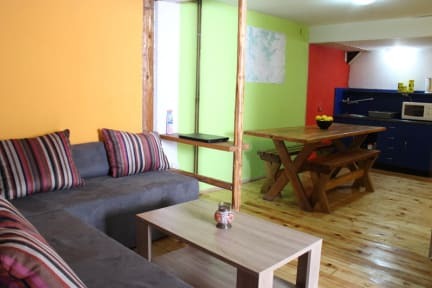 Very short distance from the bus station, 2 supermarkets within 2 minutes walk (1 of them literally next door), and all the facilities you need. Alex's knowledge of the whole Balkan region is incredible, so much so that he's practically planned out the next 2 weeks of my trip and marked it all on my maps, so if you have any questions, he'll have the answer! Atmosphere is excellent, with both Alex and his brother Stefan playing a bit part in this. Stay here!!! I highly recommend hikers den- best hostel in Montenegro. Alex is a legend, he showed me all the hikes in detail on maps.me and also helped me plan my future travels. There’s a big supermarket within a few minutes walk and 2 well equipped kitchens. Hot showers made me feel at home. I would come back in a heart beat. 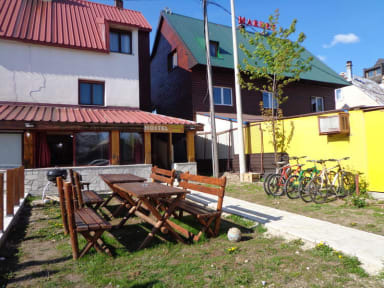 The place to stay in Zabljak! Awesome staff who are very knowledgeable about the surroundings. They can and will prepare you for any hike in the area. The hostel itself is quite cozy. I had some great sleeps thanks to comfortable beds and fresh mountain air - long days of hiking might have helped too ;) A number of other travelers were extending their stays at Hikers Den, and I wish I would have done the same for another night or two. The Durmitor NP area is outstanding and so is this hostel! The owners Alex and Stefan are amazingly fun, knowledgeable and wonderful hosts. They'll tell you where to go, how to get there, when it will rain, how much you'll enjoy it and they will be right! The time spent at the den felt like hanging out with friends. Although I initially booked just 2 nights, I ended up staying 5. I would highly recommend this place for the hosts and the atmosphere alone, though there's much more to love.